Does Tryptophan from turkey meat make you sleepy? Right around Thanksgiving, it is quite usual to find articles like this one and this one that claim that eating turkey will not make you sleepy because tryptophan will be digested, that tryptophane levels in the brain will decrease in concentration due to amino-acid competition, or that eating turkey may even boost your mood through the rise in serotonin, though the dose may be too low. The amino-acid tryptophan is a precursor of neurotransmitter serotonin which in turn is the precursor of hormone melatonin. Not everyone knows that the complete enzymatic machinery for synthesis of melatonin is not active only in the pineal organ. It is also fully functional in the retina of the eye, in the Harderian gland (located in the ocular orbit just behind the eyeball), and in the intestine. After all, the GI tract possesses a large and complex semi-independent nervous system in which many of the same neurotransmitters and hormones are found as in the brain. Actually, more melatonin is produced in the intestine than in all the other sites combined. Normally, intestinal melatonin plays a role in control of gut motility - peristalsis - and perhaps some other local functions. As usual, effects of serotonin and melatonin are opposite: whatever one stimulates, the other tends to inhibit. In most species intestinal melatonin gets degraded within the intestine. In other words, little or no melatonin ever leaves the intestine and leaks into the bloodstream. Also, depending on the species, melatonin in the intestine is predominantly synthetized during the day, during the night, or continuously. In humans, it appears that some intestinal melatonin (not much, though) leaks into the blood at all times, and that most of the synthesis happens during the day. 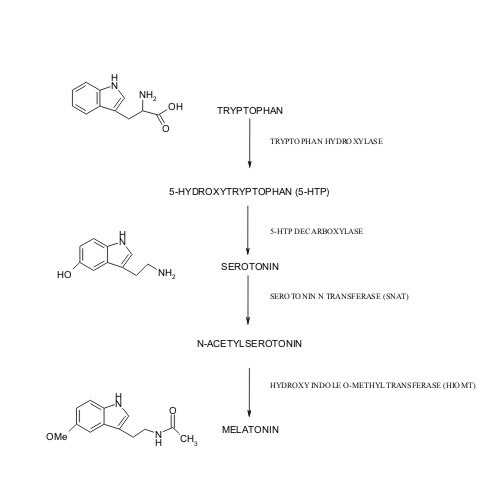 The ability of the intestine to synthetize melatonin out of food tryptophan (described above) is the first link in the chain of our hypothesized mechanism. The second link is, and that has been shown in rats and chickens, ability of extra tryptophan to promote synthesis of extra melatonin. The third link, also demonstrated in rats and chickens, is that extra melatonin leaks from the intestine into the bloodstream even if it normally does not do so in that particular species. The fourth link, also demonstrated experimentally, shows that melatonin secreted from the intestine does not in any way affect the levels of melatonin synthesis in other locations (pineal, eye). Finally, it has long been known that increasing levels of melatonin in the bloodstream can phase-shift the circadian clock, place the phase into the night, and thus promote the feeling of sleepiness. High levels of tryptophan in turkey meat and some other foods lead to increase in synthesis of melatonin in the intestine which results in more melatonin leaking from the GI tract into the bloodstream. Once in the blood, this extra melatonin phase-shifts the clock - your body thinks it is late at night and you feel sleepy as a consequence. Furthermore, this shift of the clock will result in you being wide awake right after midnight - your body thinks it's waking-up time already - something that has been reported anecdotally. Sauna-Ukko is back from a long hiatus and writes about his personal observations of Seasonal Depression. Go check it out. Here is a nice article in Washington Post - Ecological Niche May Dictate Sleep Habits - about the adaptive function of sleep. It addresses some of the themes I am interested in. First, the unfortunate fact is that sleep was initially defined by researchers of humans, i.e., medical researchers. Inevitably, the (electrophysiological) definition of sleep was thus saddled with unneccessary anthropocentric elements that for decades hampered the study of evolution of sleep. I was present at the meeting (here in Biotechnology Center in RTP) several years ago when the bigwigs of the sleep research community were first exposed to some very new ideas via not one but two talks about sleep in fruitflies (by Marcia Belvin and Joan Hendricks). That was quite an earthshaking event as the definition of sleep was substantially changed right then and there. Interestingly, the new (behavioral) definition was received not with resistance but with enthusiasm. Everyone in the room understood the potential of the new way of thinking to break off the shakles that sleep research had to suffer in for so long. Since then, the marriage of circadian and sleep research has resulted in sleep research taking off at a breathtaking speed. As a result, many old assumptions and dogmas had to be discarded. For many years sleep researchers shunned evolutionary explanations and focused on physiological and medical aspects of the phenomenon. However, progress in sleep medicine depends on a better understanding of what sleep is for - a decidedly evolutionary question. The theorists have long disagreed about one another's ideas, but most agree on one thing: If nature makes people sleep away so much of their lives, the reason has to be something crucial. That seemed to be the only way to explain why sleep-deprived people crave sleep so badly that they doze off behind the wheel of a car going 60 mph, and why rats deprived of sleep die sooner than rats deprived of food. Yet a wealth of sleep research has regularly produced baffling paradoxes and conflicting lines of evidence about the uses, role and need for sleep. If sleep is primarily about providing mental rest, why do people's brains remain so active during sleep, as research in recent decades has found? If sleep is about providing the body with rest, why do couch potatoes need as much sleep as Olympic athletes? Moreover, animals such as horses, which perform far more physical labor than humans, need much less sleep than people do. If sleep primarily hones cognitive functions, why do the intellectually lazy need as much sleep as Nobel Prize-winning physicists? Also, why do humans -- who are a lot smarter than rats -- sleep less than rodents? Jerome Siegel, a psychiatrist at the University of California at Los Angeles who described these discordant findings in acomprehensive review of the available research, published in the journal Nature last week, said he began to question the notion that sleep performs some essential function after noting that species that sleep less than others do not sleep any deeper -- as they would if they were making up for the shorter time. Animals that sleep fewer hours generally sleep less deeply, while animals that sleep longer usually sleep more deeply. Siegel, a respected sleep researcher who is also affiliated with the Department of Veterans Affairs, said he came to the conclusion there was only one explanation that could explain the paradoxes: in a word, evolution. Rather than being designed to perform some critical function, Siegel wrote in his paper, sleep may be the way various species, humans included, have adapted to their ecological niches. While many valuable functions probably take place during sleep, Siegel suggested that it is possible that those functions are not the reason for sleep. "There is this huge variation in sleep across species, and it fits with this huge variation in the niches that animals occupy," Siegel said in an interview. "The analogy I make is between hibernation and sleep," he said. "No one says, 'What is hibernation for? It is a great mystery.' . . . It's obvious that animals hibernate because there is no food, and by shutting down the brain and body they save energy." Sleep, Siegel suggested, may play much the same role. As evidence, he cited research that has found systematic differences in the way carnivores, omnivores and herbivores sleep: Carnivores sleep longer; herbivores, shorter; and omnivores, including humans, are somewhere in the middle. "If animals have to eat grass all day, they can't sleep a lot, but if they eat meat and are successful at killing an antelope, why bother to stay awake?" he asked. On the other hand, mammals at greater risk of being eaten -- such as newborns -- spend large amounts of time asleep, presumably safe in hiding places devised by their parents. Supporting the evolutionary explanation, Siegel's own research has shown that when the luxury of safe hiding places is unavailable -- in the ocean, for instance -- baby dolphins and baby killer whales reverse the pattern found among terrestrial mammals. These marine mammals sleep little or never as newborns and gradually increase the amount they sleep as they mature. The theory does not so much contradict other theories about the role of sleep as much as place them in context: "What I am saying is that it is not that sleep has been adapted to allow some vital function to be fulfilled, but the core function of sleep is to adapt animals to their ecological niche," Siegel said. "Given the animal is inactive for a certain period of the day, certain functions will migrate to that period because it is more efficient" to perform them at that time. Interestingly, this hypothesis does not conflict with an old (and frankly quite unpopular) notion that mammals and birds did not evolve sleep as a new process (after all, insects sleep, we now know), but that they evolved wakefulness as a novel state of the mind. Insects, fish, amphibians, reptiles etc., have periods of activity and periods of slumber. The period of slumber corresponds to mammalian/avian state of sleep. But, the active state in cold-blooded animals is more similar to sleep-walking than real wakefulness. Did birds and mammals independently evolve wakefulness or was there a whole suit of (now extinct) reptilian and dinosaurian lineages who were also wide awake? Did evolution of wakefulness provide a substrate for the evolution of consciousness? Interesting speculations, but nothing close to an answer to date. At least, provocative hypotheses by Jerome Siegel and some others are prompting the sleep scientists to reconsider everything they hold dear and therein lies progress. Update: Siegel's paper is now available online for free. Carl Zimmer has an article on this in tomorrow's New York Times.